Jill must have gone up the hill with Jack at the racetrack and did more than fetch a pail of water (and didn't tell anyone). 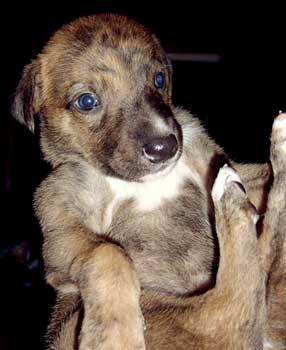 She gave birth to her litter of five puppies on August 9, 2006. Three males and one female survived. Being a mother comes naturally to her and she has settled right into that role. She's a very attentive little mommy. She is a beautiful red fawn girl, almost 2 ½ years old. She's a healthy 59 pounds. 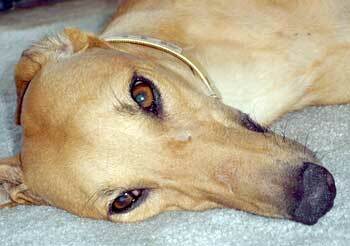 Retirement and motherhood both suit her, and she has adjusted easily to the good life in a home. She and her pups instantly integrated into her foster home with four other dogs (three small ones and one Greyhound), one cat, and a three-year-old toddler. Check out the slide show at the bottom for more pictures. Austin is the most handsome of the puppies. 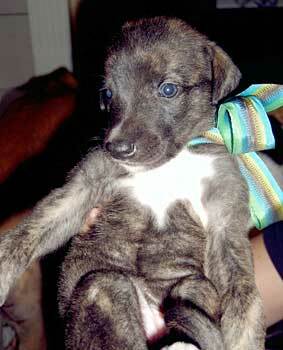 He is light brindle in color with a white patch on his chest. He LOVES to play and romp with his brothers and sister! Austin makes grunt sounds as he tries to get a game going with whomever his current victim is. Cash is the clumsiest little fellow of the group! Bless his heart, he took off running straight into a wall the other day and gave himself a bloody snout! He's fine now, but he was not thrilled for about 2 or 3 whimpering minutes! 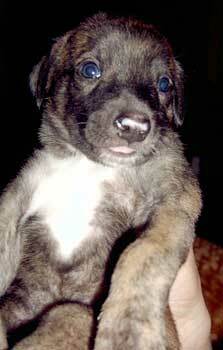 He is dark brindle in color, very similar to Daisy, except he has a pink patch on his nose. 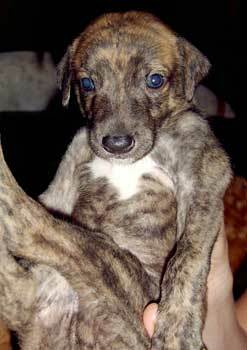 Daisy is the only female and has a beautiful dark mask and is dark brindle in color. She is the cuddler of the group for sure! She is content to snuggle up to anyone willing to let her, and is so kissable!